The Jacksonville Jumbo Shrimp announced an extension with the city of Jacksonville, a deal that will keep the Double-A franchise at the Baseball Grounds through 2033. Don’t expect the Jacksonville Jumbo Shrimp to swim off any time soon. 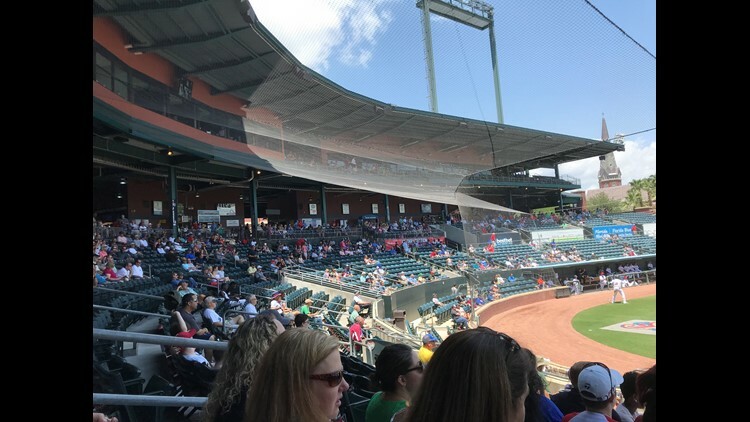 The Southern League club has agreed to a 10-year lease extension with the city that would keep the Jumbo Shrimp at the Baseball Grounds of Jacksonville through the 2033 season, the team announced Wednesday. In a statement, Jumbo Shrimp owner Ken Babby described the extension as one of his top priorities. “With this lease extension we are stating firmly that we are committed to this community for a long, long time,” said Babby, who completed the team’s purchase in 2015 from the Bragan family for an estimated $20-25 million. The Double-A franchise, formerly known as the Suns from 1991 until 2016, has played at the Baseball Grounds since its 2003 construction. The ballpark took the place of the since-demolished Wolfson Park. Southern League attendance figures this year recorded a total of 317,335 fans for Jumbo Shrimp home games. That’s a decline of 2.6 percent compared to the 2017 season, immediately after the team’s rebrand, but still ranked second in the league behind only the Birmingham Barons’ 391,061. The 2018 season also marked the first time this decade that the club averaged 5,000 or more fans per game in back-to-back years. The agreement nails down the team’s future in Jacksonville amid speculation of franchise moves elsewhere within the 10-team league. Earlier this month, the Triple-A New Orleans Baby Cakes, like the Jumbo Shrimp a current affiliate of the Miami Marlins, announced its intention to move as early as 2020 to Wichita, Kan. Following that news, the New Orleans Advocate reported that a group of investors there are seeking to move an existing Southern League team to the Louisiana city. The Southern League has seen two franchise changes within the past decade: The Pensacola Blue Wahoos took the place of the Carolina Mudcats starting in 2012, and the Huntsville Stars moved in 2015 to Biloxi, Miss. Jacksonville’s run of 49 consecutive Southern League seasons, dating back to 1970, is the longest in the league. Only the Tennessee Smokies, based in the Knoxville area since 1972, and Chattanooga Lookouts, from 1976, have played more than 40 straight Southern League seasons in their current markets. Click here to read the Florida Times-Union story.